Answer: Notice anything odd about these sites? This week's Challenge was to say what's odd about these three really interesting sites. For each site, the question is the same: What strikes you as odd about this web site? If you run across this site, what triggers you to dig a little more deeply into what's going on here? See anything odd about these sites? 1. RYT Hospital A new hospital describes its services. Is this a real hospital? How can you tell one way or the other? What tells you that it's real? Does anything make you suspicious? 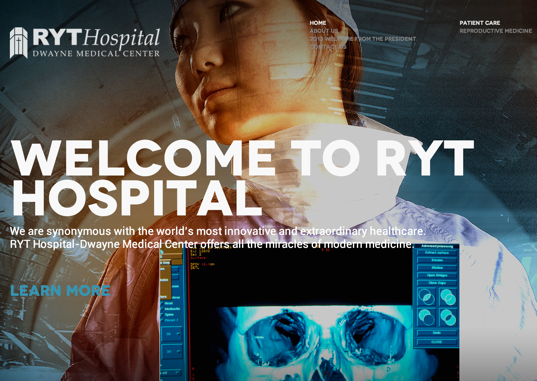 When I first found the RYT Hospital site, I was very impressed. It's got gorgeous graphics and a slick interaction style. Someone clearly spent a lot of time crafting this site to make it have a high gloss, high-tech feel to it. and quickly found that it's prominently featured in lists of online hoaxes. If you keep digging, pretty quickly you'll find that "Elizabeth Preatner" is the only MD whose name you'll find on the site. Checking into her (which is a great credibility checking step) reveals that she's pretty sketchy as well. Unfortunately, she also appears in the book "Case Studies in Biomedical Research Ethics," a serious text from MIT Press--a publisher that doesn't usually condone hoaxes. So what's going on? Conclusion: Pretty bogus. But it is beautifully done. 2. 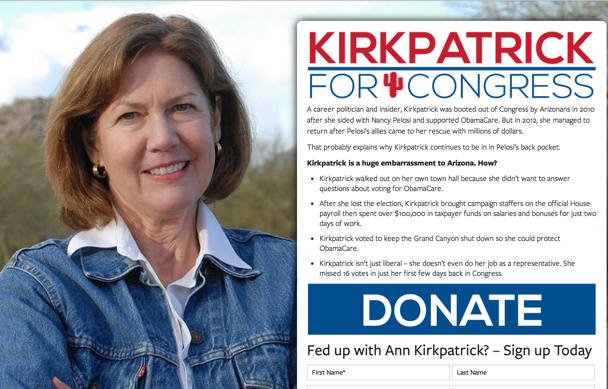 Ann Kirkpatrick runs for re-election. Does anything strike you as odd about this site? What can you do to verify that it's an accurate site? The first thing that tipped me off here was the dissonance between the appearance of the site (looks like a fundraising site) and the language of the site. Everything is fine until you read the negative language that's in play here: "..in Pelosi's back pocket.." or "Kirkpatrick is a huge embarassment.." or "..she doesn't even do her job.."
This all sounded really out of joint. 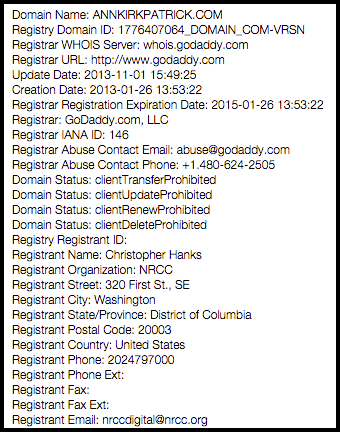 It doesn't take long to find out that this site was created by NRCC.org. Look them up and you'll find: "The National Republican Congressional Committee (NRCC) is a political committee devoted to increasing the Republican majority in the U.S. House of Representatives." If you actually click on the big DONATE button, you're immediately taken to a web page that clearly says what their goal is. Conclusion: Bogus, and a bit of political trickery besides. 3. Dihydrogen Monoxide Some chemical compounds are deadly. Is dihydrogen monoxide inherently dangerous? When I first saw this I was surprised that there was something that sounded toxic, but that I'd never heard of before. How could this be? I have to admit that I picked up on the questionable nature of this site pretty quickly. I thought "So what IS dihydrogen monoxide?" And picked the nomenclature apart: 2 hydrogens with one oxygen atom. That's H2O! That's what I did. But suppose you didn't notice that right off the bat. What would you do to check this? I scanned the pages, clicking around a bit to just check things out. That's when I started to notice some things that were a bit off. Then there's the statement at the bottom of the page: "Content veracity not implied." And there, the author, Tom Way, fesses up. He created the site in late 1997 as a way to vent steam about the ways in which reporting about chemistry was being mishandled. He made the site to point out a bit of critical thinking skills. It's a hoax site with a message: Read these things carefully. Conclusion: Bogus, but done with an eye towards teaching us about overblown language, and the value of careful reading. You've probably heard these before, but they bear repeating. 1. If something sounds too good (or amazing) to be true, it probably isn't. Check your facts. Look up the person. Verify the address. Male pregnancy? Amazing. Check it out before you check it into your brain. 2. Dig a little deeper. We've talked about using WHOIS before. It's a basic skill whenever you run into a site that you don't know about. Make sure you know who's posting that content. (Quick summary: [ whois ] click on one of the links offering this service, then enter the web site address to find out who's running the site. 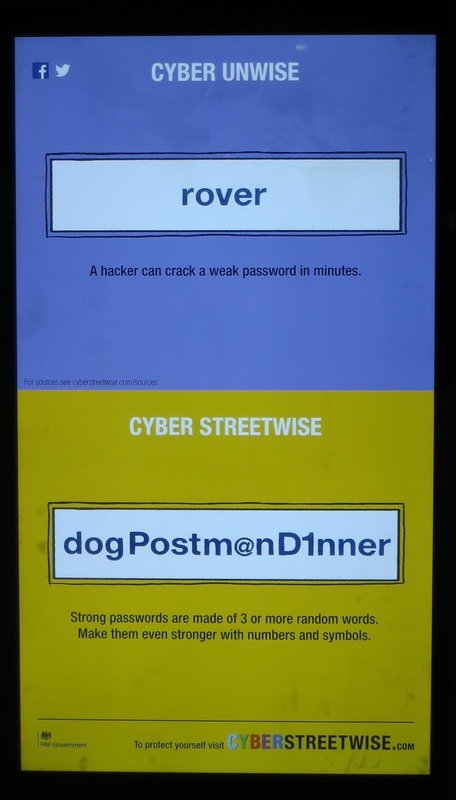 Or.. this poster I saw in the train station in Edinburgh last week. More good advice. Lindgaard, Gitte, et al. "Attention web designers: You have 50 milliseconds to make a good first impression!." Behaviour & information technology 25.2 (2006): 115-126. Search Challenge (10/29/14): See anything odd about these sites? YOU have to stay ALERT. The internet is full of amazing, fascinating, incredible stuff. And that's the question for today: credible? Or incredible? Watch your step. There are dragons in the world. Here, for your contemplation, are three really interesting sites. For each site, the question is the same: What strikes you as odd about this web site? If you run across this site, what triggers you to dig a little more deeply into what's going on here? Please leave your analysis in the comments below. Don't just say "it's obviously bogus" or "it's obviously correct." Say WHY you think that, and what research steps you took to validate / invalidate the claims of the site. And say what--if anything other than being on the "Search Challenge" page--led you to question its authority! If you enjoyed the Search Challenge about Comet 67P/Churyumov-Gerasimenko, you'll enjoy looking at this collection of images that are coming from the Philae orbiter. Check out the full set of pics at Imgur "This is what the surface of a comet looks like" or see the Comet Watch blog. Here are a couple of images from ESA to get your imagination going. Answer: Where are these places? Once again, I'm impressed with the search savvy of the SearchResearch Irregulars! Nice job. 1. 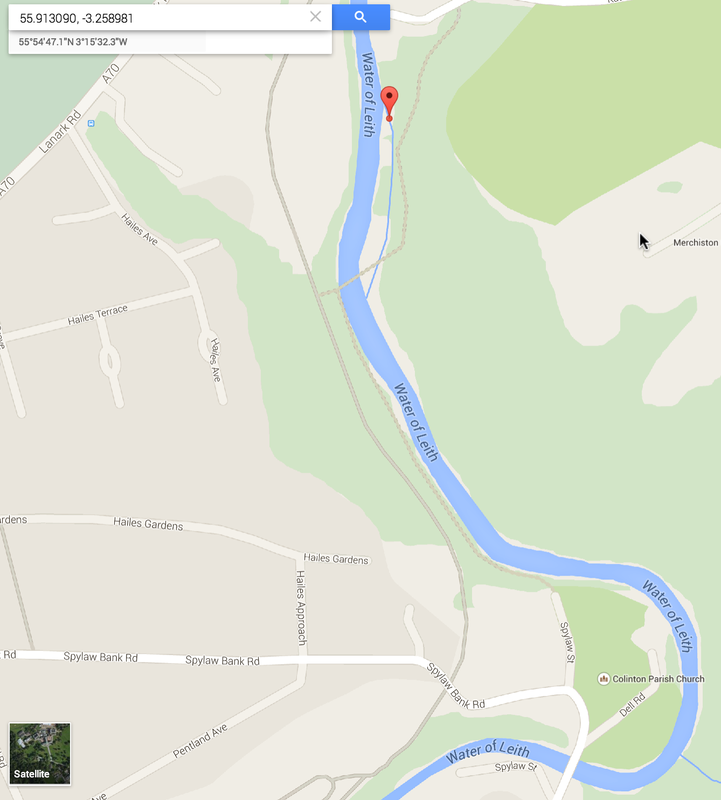 What is this strange obviously artificial waterway? Did it serve any particular function? If so, what? The lat/long is 55.913090, -3.258981 Link to full-size photo. 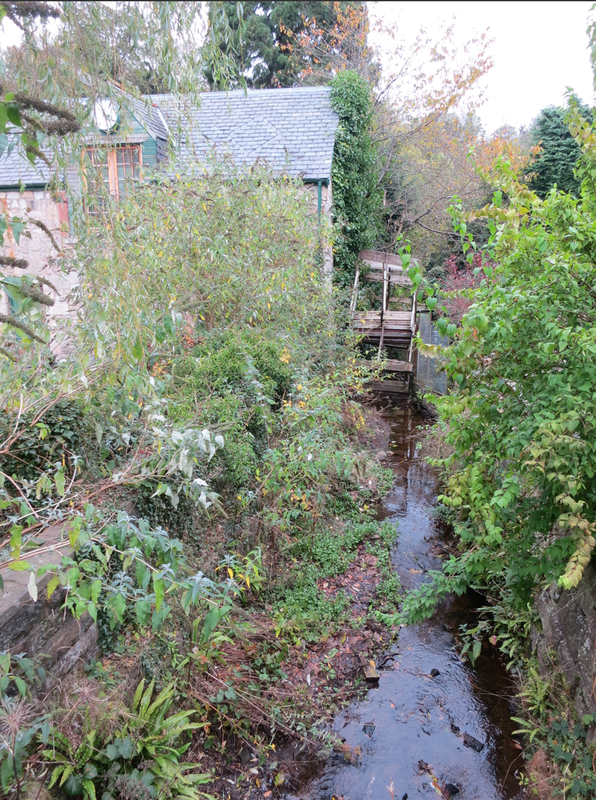 If you've seen enough maps, you'll recognize this as a flume (or mill race) that's diverting water from the river (in this case, the poetically named "Water of Leith") to turn the wheel of a mill. Another clue can be seen in the name of the road at the top right--"Katesmill Rd"--I'm willing to bet there's a mill here. If you switch to Satellite mode view, you can see something even more telling. Scan up-river from that point on the flume, and you can just barely see the suggestion of a weir (that is, a low-dam used to hold back water to feed the flume). Here are a couple more images to show you the ground truth at this site. Here you can see an old mill wheel on the flume. A date engraved on the bridge (from which I took this picture) is 1839. 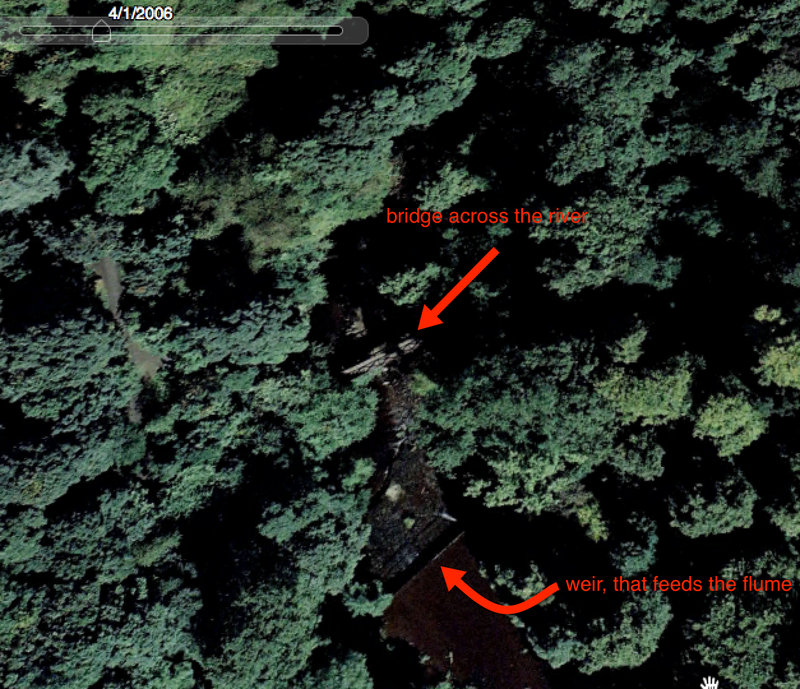 And just so you can correlate the above aerial image with a view of the weir from the ground, here's the weir. 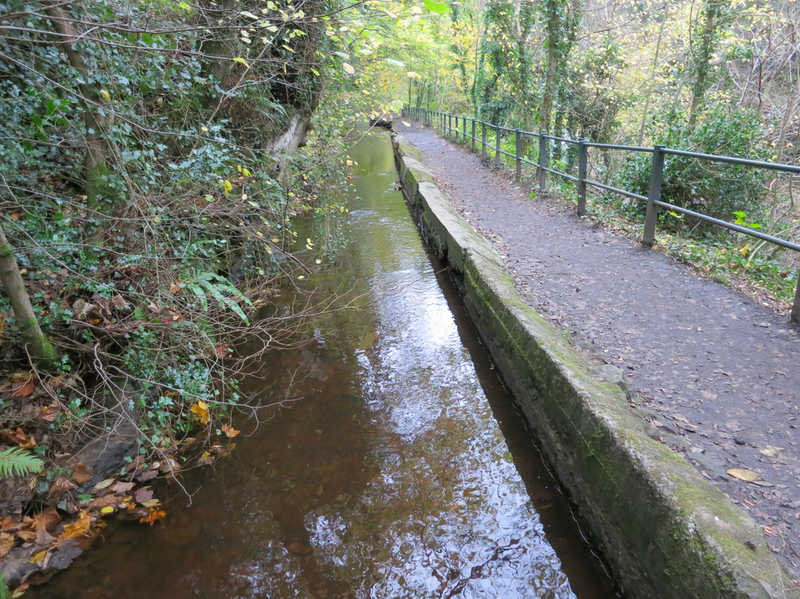 Water of Leith weir that feeds Redhall and Kate's mills. Again, for this I'd turn to maps. Since you know I didn't run very far from the flume (all the pictures were taken within a few minutes of each other), the simplest way to track this down is to check out the map and search for churches. All I did was zoom out a bit and look for the church symbol. 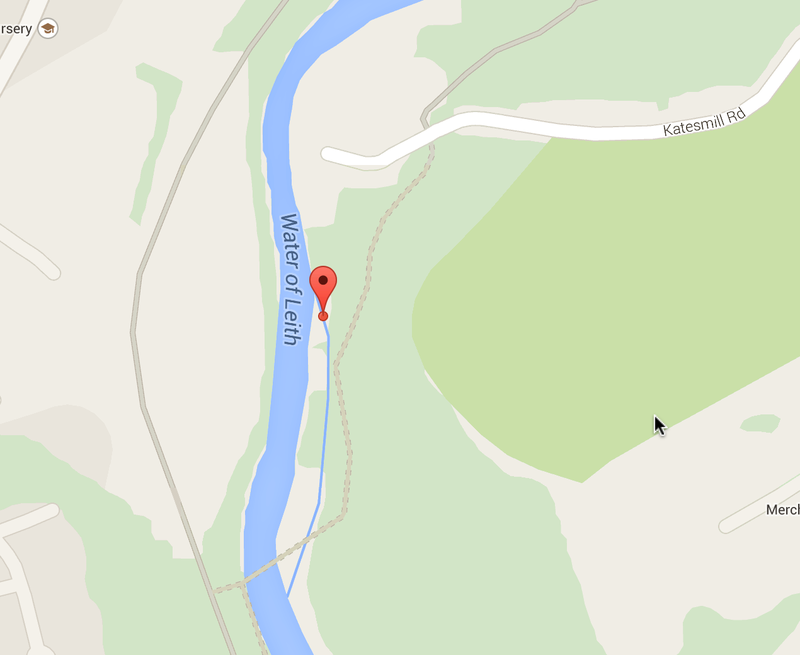 The Colinton Parish church shows up at the bottom of the map, only a few hundred yards away. See the church icon in the lower right? Clearly, the Colinton church is closest. The association with a writer? 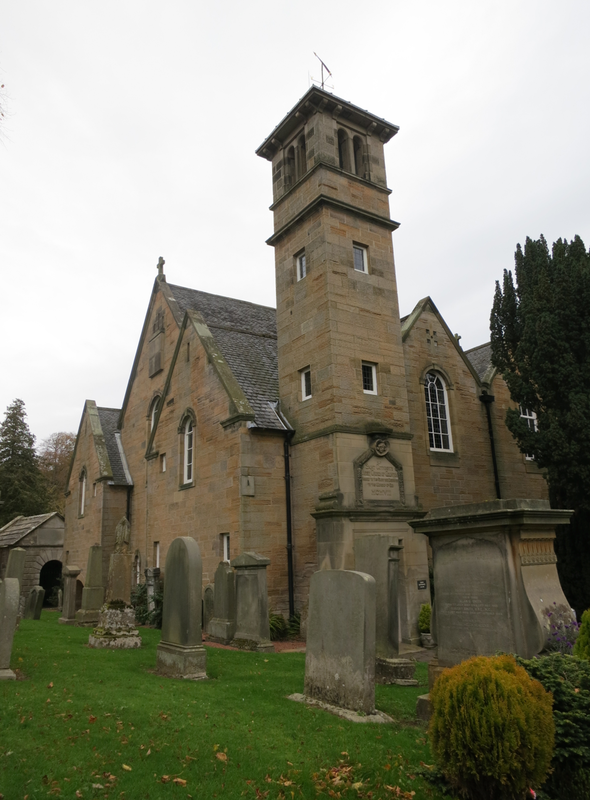 leads us to many articles linking the famous novelist Robert Louis Stevenson with Colinton and this church in particular, since he spent many summers in Colinton when his grandfather was the parish minister. 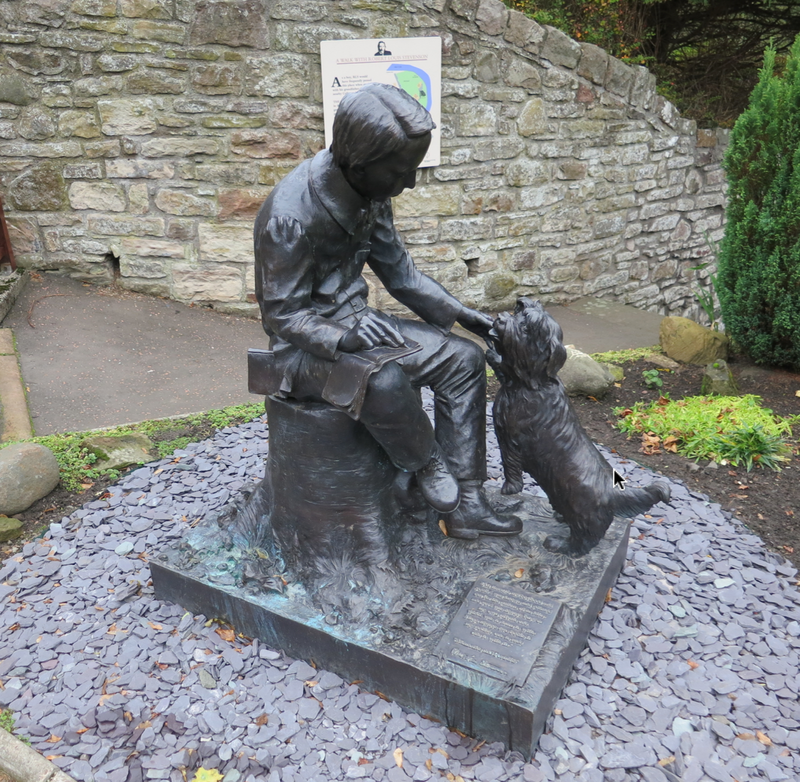 What's more, reading a bit farther down in the SERP, you'll find that a statue of RLS was set up just outside the parish church gate. This is also available on SteetView, BTW. And the tree? It's a yew treet (which the sign behind RLS says). "The name The Swing Café was inspired by a poem by Robert Louis Stevenson whose grandfather had been the minister at Colinton. Stevenson wrote the poem about the swing in the manse garden where he had played as a child. The location of the swing can be seen, outside the Dell Room window, in the old yewtree." 3. 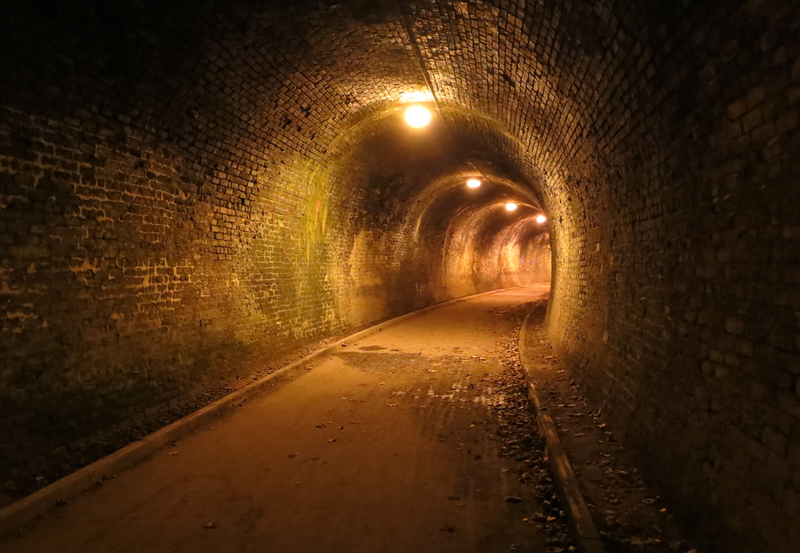 How long is this tunnel? Hope you found this an interesting Challenge. There are a couple of insights here as well. 2. Remember to check the satellite views AND the archival Google Earth images. 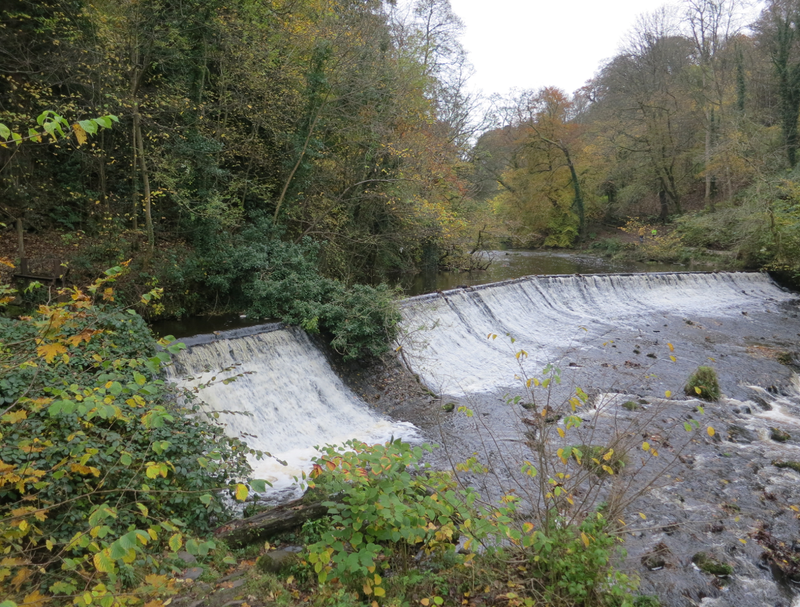 Only one of the images actually shows the weir. It's a fairly deep gorge, and Edinburgh is pretty far north so many of the pictures only show shadow. Check other sources. 3. The Maps list view is sometimes a very handy way to see a large number of hits on a single map. Check out this view of the coffee shops of downtown Boulder, CO. Where would YOU go for coffee?? And... because I know you're wondering, here's the poem that was inspired by the yew tree in the courtyard of the Colinton Parish church. 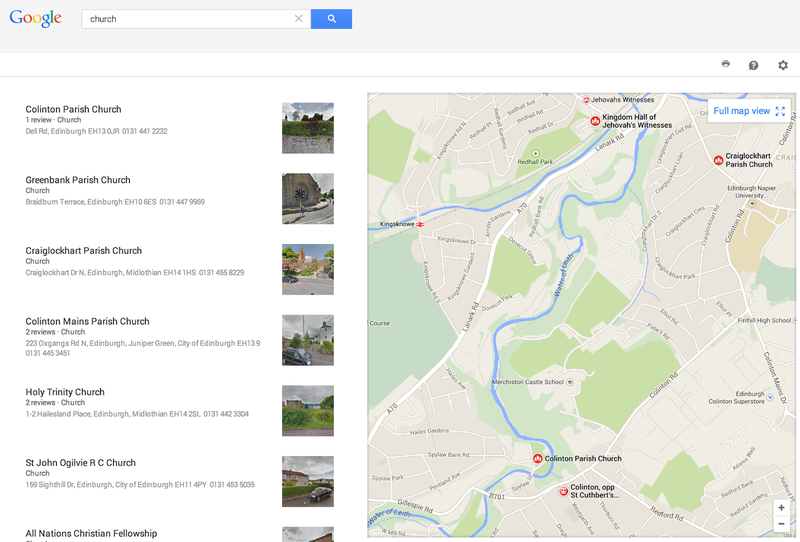 Search Challenge (10/22/14): Where are these places? I'm traveling again, and took a few photos on my run this morning. They were all taken within 15 minutes of each other on an overcast morning. I need your expert help in getting a bit of information about the scenes and locations they depict. For each photo, a link to the full image is given by the link in the caption. I'll save you a step: the lat/long is 55.913090, -3.258981 Link to full-size photo. 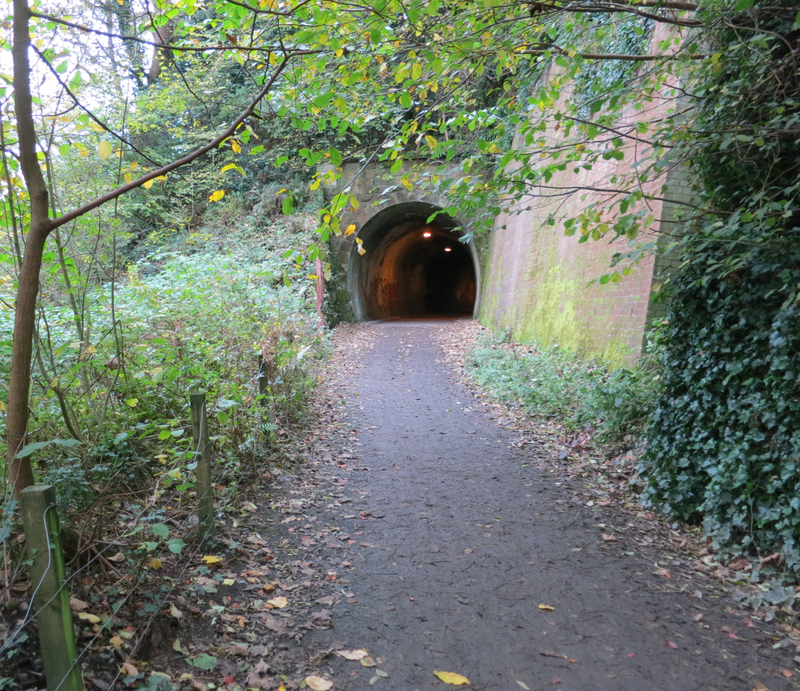 I ran through the tunnel, so I have a good idea. But here's picture from roughly the middle. Can you help me out with my research? These questions weren't that hard, but they're definitely interesting. Let's answer them one-by-one, then wrap up with an observation. 1. What's a plagal cadence? What does it sound like? Where might I have heard one before? That's a funny phrase, "plagal cadence," so the obvious thing to do is first get the definition and work from there. quickly tells us that: "...A Plagal Cadence refers to the chord progression of IV to I or Subdominant to Tonic. As such, it is the cadence most often used at the end of hymns for the final "A-MEN." Ah. It's at the end of many hymns--that's where you might have heard it before. In the key of C, it's a shift from an F chord to a C chord. Interestingly, as the "Amen" tag, it's really a separate kind of little "coda" to the main body of the hymn. You know, you sing the entire hymn, and then you sing, "Amen." As the Wikipedia article points out (correctly) in quoting William Caplin's text , "...Most examples of plagal cadences given in textbooks actually represent a postcadential codetta function: that is, the IV-I progression follows an authentic cadence but does not itself create genuine cadential closure." Yeah. What I said, except clearer. On that page is an MP3 collage of "mu major" samples from various Steely Dan tunes. You can hear the chord there. 3. Is there any connection between trumpet playing and getting hemorrhoids? There are lots of anecdotes, but can you find reliable data on this? To tell you the truth, this is a common thing you hear musicians say. (As are comments about the intelligence of viola players...) So I was curious what we could find out. and fairly quickly found the Master's thesis of M.R. Dyk (1991) about the physical and psychological disabilities of professional musicians. In that thesis she repeats the association of hernias and hemorrhoids with trumpet performance, but gives no citations or data. I then went to PubMed (the medical literature search service of the National Library of Medicine) and did a simpler search, just [ trumpet hemorrhoids ] and found... nothing. As Debbie G pointed out, there IS a Google Group that started as a support group for trumpet players with this issue, but it only went for 10 messages before petering out. 4. I love listening to the music of folk singer Jez Lowe. In his lyrics he keeps mentioning Durham (such as "Back in the Durham Jail"). Problem is there're a lot of Durhams in the world. Which Durham is he talking about? Search Lesson: As I said, these weren't that difficult, but I wanted to highlight the value of YouTube as a resource (for plagal cadences and "Steely Dan chord" examples). Hope you enjoyed the searches and what we discovered in the process! Caplin, William E. (1998). Classical Form: A Theory of Formal Functions for the Instrumental Music of Haydn, Mozart and Beethoven. Oxford University Press. pp. 43–45. ISBN 0-19-510480-3. Answer: YOU make up the Challenge!